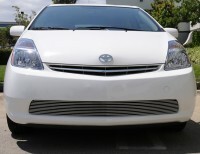 25927: 04-08 Toyota Prius (w/out Fog Lights) Bumper Billet Grille. This highly polished Bumper Billet grille has an approximate installation time of about 1hr. Comes with complete directions and hardware. Backed by manufacturers lifetime warranty. Tell your friends about the Bumper Billet Grille (w/out Fog Lights). Share this product on Facebook, Twitter, MySpace or send an email to a friend!